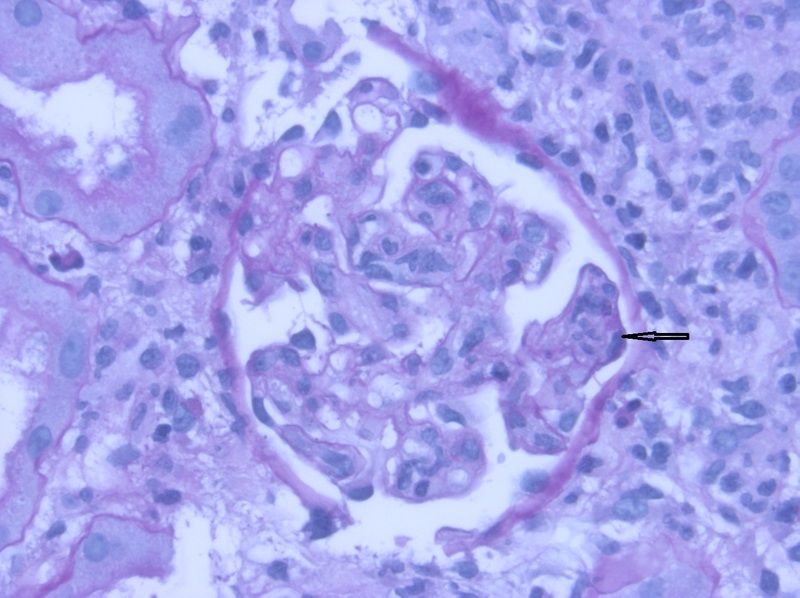 The renal biopsy plays an important part in the management of systemic lupus erythematosus. It helps determine the most appropriate initial therapy and provides prognostic information. It also plays an important part in documenting ongoing inflammatory activity as well as overt relapse. The threshold for demarcating these classes has been clearly defined. 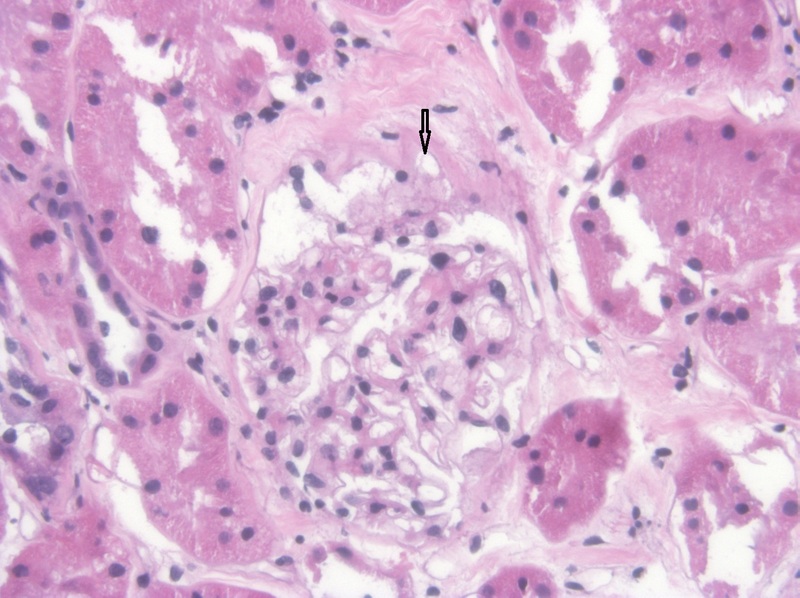 The minimum mesangial hypercellularity required to make a diagnosis of class II lupus nephritis is the presence of ‘four or more nuclei fully surrounded by matrix in mesangial area not including the hilar region.’ This definition is identical to the definition of mesangial hypercellularity that is used in the Oxford classification of IgA nephropathy. ‘Endocapillary hypercellularity’ replaces ‘endocapillary proliferation’ (see figure below). This is a more accurate term as an increase in cellularity can be the result of inflammatory influx and does not necessarily require proliferation. An illustration of endocapillary hypercellularity. The glomerulus is infiltrated by inflammatory cells which reside primarily within the capillary lumen and cause luminal narrowing. ‘Crescents’ have been specifically defined and subclassified as ‘cellular, fibrous, or fibrocellular.’ Precise definitions have also been given for adhesions and fibrinoid necrosis (see figure below). 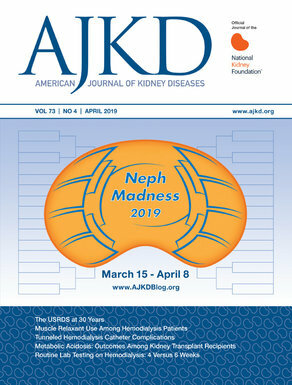 An adhesion is defined as an area of isolated continuity of extracellular matrix material between the glomerular capillary tuft and the capsule. It is no longer recommended that class IV be subdivided into segmental and global categories. This subdivision is subjective, not very reproducible, and not prognostic in all studies. The designations ‘A, C, and A/C,’ respectively, for ‘acute, chronic and acute/chronic,’ have been replaced by a formal scoring of the activity and chronicity indices (see below). No changes have been made but studies are planned to develop better definitions for biopsies that should be called class III + V.
No changes have been made but it is recognized that a more precise distinction from advanced stages of chronic class IV lupus nephritis is needed. ‘Endocapillary hypercellularity’ replaces ‘endocapillary proliferation’ for the reason explained above. ‘Neutrophils/Karyorrhexis’ replaces ‘leukocyte infiltrate.’ This is because karyorrhexis is typically the result of neutrophil fragmentation and it is logical to group both lesions together. ‘Cellular/fibrocellular crescents’ replaces ‘cellular crescent.’ In other words, both cellular and fibrocellular crescents are accepted as indicators of acute inflammatory activity. ‘Interstitial inflammation’ replaces ‘mononuclear cell infiltration.’ This change recognized the role of neutrophils, eosinophils, and mast cells in the pathogenesis of tissue injury. ‘Total glomerulosclerosis score’ includes both globally and segmental sclerosis, since global sclerosis only captures later stages of disease. – Post prepared by Parmjeet Randhawa, AJKDBlog Contributor. For more PathPointers, visit AJKDBlog.org.